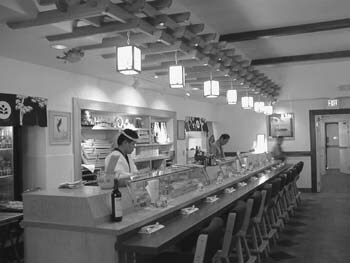 Sitting Pretty: The airy, simple decor of Midori makes a pleasant setting for the creations of the sushi chefs. ONE THING THAT A "Grand Opening" banner guarantees is a burst of enthusiasm from the restaurant staff. During this festive time, owners eagerly seek to make friends of patrons and diners hope to become the "original fans" of something great--and thereby earn bragging rights. So there we were, nosing around Midori, peering into windows, as anxious as first-time home-buyers. Encouraged by promising indicators, we shouldered our way inside early enough to smell the fresh paint on the wall. Snappily spotless from floor to ceiling, the airy dining room calls to mind a Japanese country manor, its white-washed walls complemented with yards of glossy pine. Brightly lit and distinctively simple, Midori's interior decor eschews garish "ethnic" trimmings. Of course, no good-sized Japanese eatery could be without tatami chambers, and Midori has several. Thank goodness, there isn't a square inch of Naugahyde present. Booths are tastefully upholstered with straw mats, surprisingly comfortable even for extended meals. As in any brand-new establishment, we prepared ourselves for a rough service experience, but it turned out adequate, our waiters making up for shortcomings with smiles and extra effort. Not having had the time to acquaint themselves with the menu, the waiters could neither explain the specials nor give solid recommendations. Not a problem. We sampled extensively from the nigiri sushi selection ($3-$5.50), which was heavily traditional, and could not once fault our chefs. They carved some of the juiciest and generous bites in the South Bay. From tuna to shrimp to yellow tail, the seafood was impeccably fresh and filleted with laser precision. Great care had been taken with the grilled bits as well. Our unagi ($4.25)--teriyaki-brushed eel grilled with the skin on--tasted moist and buttery, fresh off the range. The gemlike perfection of ikura ($3.50)--salmon roe in nori and rice--provided savory entertainment. Midori doesn't do much in the way of "American pop" sushi. Its one nod in that direction was a somewhat average California roll. Our next favorite parts of the menu came from the appetizer and a la carte sections. Ranging from about $3 to $5, the mix of items, all classic favorites, made heady business of choosing a meal. Some 30 entries graced the page, including salmon roe with radish, chicken yakitori, grated mountain yam with tuna, and tiger eyes (broiled squid with tuna). The butter fish misoyaki ($5.25) was a half-inch-thick, six-inch-wide steak, its gold surface grill-scored, its inside creamy sweet. Slightly salty, this filet could very well be appreciated with a bowl of steamed rice, perhaps with a great side of shrimp and vegetable tempura ($4.95). Gyoza (pan-fried or steamed, $3.95) won our applause for delicate composition. Thin, al dente dumpling purses, properly steamed atop a bed of cabbage in a bamboo steamer, hosted savory treasures of onion and pork that were beguilingly succulent. And our other favorite--chopped scallop mixed with shrimp, scallion, sweet peas and bell pepper ($5.50)--was a tiny portion but tasty and fun to eat. Desserts saw us spooning up green-tea ice cream and strawberry-flavored mochi (ice cream in chewy rice dough), each $1.75. Over a few cups of ocha, we grilled the host for information about the restaurant. Apparently, Midori's owners (no relations to Midori Sushi in Campbell) have continental aspirations; this is the first of a contingent that will include operations in New York, Los Angeles and Toronto. Another Midori is slated to open in Menlo Park by the end of this year. Judging from our very good meals, we wish the Midori management the best. North America can always use more great Japanese restaurants. From the August 20-26, 1998 issue of Metro.